Long before Walter Mart in the city of Makati, Philippines, became the modern 5-floor shopping mall it is today, it was once just a quaint supermarket with some food shops fronting the streets. My good friend Harry and I frequent a Chinese restaurant there, and we usually have a couple of chicken feet dimsum with our order. Coupled with beer and a host of other Chinese food goodies, it was a great recap to a long day at the office. We Filipinos also have a recipe for chicken feet, cooked in the customary adobo way. 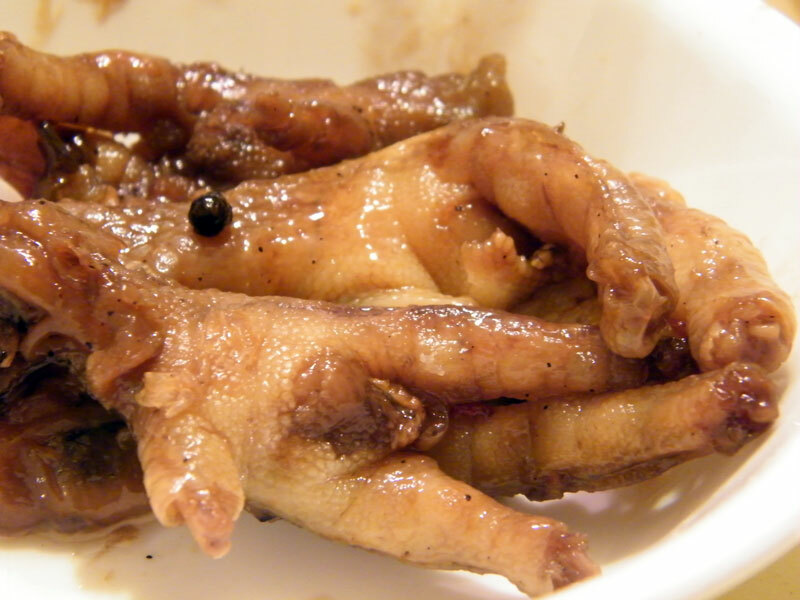 Chicken feet adapts well to the adobo treatment, with a flavours thoroughly enhanced a day after it is cooked. The result is a gelatinous, lip-smacking yummy treat. The title is a fun reference to how we call chicken feet when served as street food. Heat up cooking oil in frying pan and cook chicken feet until light brown. Set aside. Add a bit more oil and saute onion and garlic. Return the chicken feet, soy sauce, and water and continue cooking over medium heat. When it starts to boil, add the laurel leaves, peppercorn, salt and sugar. Reduce heat and simmer for about 30-45 minutes or until chicken feet are tender. Add the vinegar. Do not mix. The vinegar will produce a strong smell in the first few moments, then it will mellow down. Season with salt and sugar, according to taste. Serve either as beer food or as viand with hot, steaming rice.